Good news: there are a ton of great trade shows and conferences specifically designed for the safety industry. Whether you work in mining, fire rescue, construction or occupational health, there’s a show for you. Bad news: with so many available, deciding which one(s) to attend can be a challenge! I’ve been planning and attending safety shows across Canada and the U.S. for over ten years and I never get bored. There’s always new technologies to see, legislation updates to learn, friends in industry to visit with and so much to experience in each unique city and province. Each year the Saskatchewan Safety Council brings together hundreds of professionals to discuss the importance of workplace safety in the heart of the prairies. The average attendance in the past three years was over 750 delegates from all different fields including mining, utilities, oil and gas and government agencies. This year you can expect a booming tradeshow with over 100 displays and nearly 30 educational presentations and speakers. Talk about a jam-packed five day event! This show always creates a lot of buzz in the Maritime Provinces, and for good reason! Safety Services Nova Scotia does a fabulous job at organizing this conference to be specifically tailored for east coasters working in safety. In addition to the trade show, there are a ton of different seminars available covering all topics from risk assessment to mental health in the workplace. This conference provides a great opportunity to network, share best practices and learn what’s new in the world of safety. If you’re a fan of CBC Radio’s “The Debaters”, be sure to make it on time to enjoy the comedy of Patrick Ledwell, who will be the MC for the two-day event this year. If you work in oil and gas, look no further. The Petroleum Safety Conference is the premier industry-specific show to attend. Since its inception in 1951, this conference has connected safety experts, influencers and companies together with the common goal of keeping workers safe. The conference’s tagline “Engage. Exchange. Empower.” hits the nail on the head for what you can expect to get from attending. Share knowledge, pursue new ideas and learn from the best at this Energy Safety Canada event. “Mining safety” is a loaded term which can include respiratory protection, confined space safety, protective clothing and so much more. Whether you work in an open pit or underground, there are so many considerations that need to be made in order to ensure the safety, health and wellbeing of workers. Fortunately, the CIM Convention covers it all. This unique convention and expo includes expert-led short courses, three full days of technical presentations divided across seven different and innovative themes, networking opportunities, a student/young leaders program and, of course, a world-renowned trade show that showcases the latest in mining equipment, tools, services and products. Hosted by Workplace Safety & Prevention Services, the annual Partners in Prevention conference is a big one – in fact, it is the number one safety show in all of Canada. Each year, over 4,000 like-minded safety professionals pack the International Centre in Mississauga to discuss best practices, understanding legislation, new products, technological advancements and more. This year’s conference has a “safety superhero” theme designed to help all workplace safety advocates. Rick Mercer, Canadian TV personality and bestselling author, will be providing a key note speech which I’m sure – like with all things he does – will be fantastic. Did you know that the Ontario fire and emergency services market is a $1 billion industry? Here’s where it all happens. 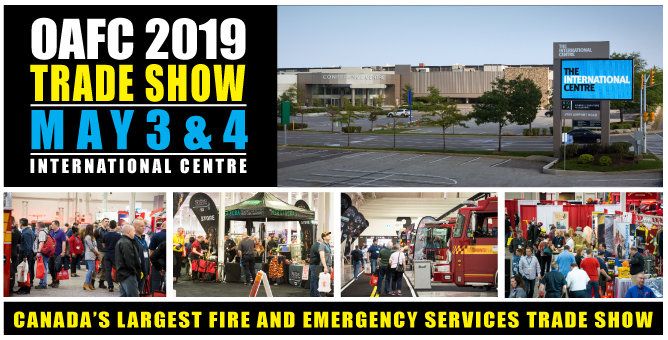 The OAFC Tradeshow has over 170,000 square feet dedicated to fire and emergency response-specific products and services; nowhere else in Canada will you find such a gathering under one roof! This event is the largest and most successful trade show of its kind and is a must-attend event for anyone in the industry. The next one on my list brings us south of the border – way south. The American Society of Safety Professionals will be hosting their annual Professional Development and Exposition in New Orleans this year. If you’re looking for a good way to combine business and pleasure, this could be the show for you. For more than 50 years, this mega conference has brought together the occupational, safety and health industries across the U.S. to reconnect on education, products and their passion for safety. There’s over 200 sessions available, a town hall debate with over 5,000 health and safety professionals and a massive trade show where you can see the newest products and demonstrations from America’s leading safety providers. After hours, there’s endless things to see and places to eat delicious Creole cuisine. As the city’s motto goes, “Laissez les bons temps rouler!” – or, let the good times roll! For its 39th consecutive year, the Canadian Health Care Engineering Society will be hosting their Annual Conference of the Canadian Healthcare Engineering Society in Saskatoon. Known as the “hub” that enables resiliency in healthcare, this conference welcomes attendees from over 400 healthcare facilities across Canada. The CHES Conference is a fantastic place for those in the field to expand their knowledge base, network and continue their education. The Canadian Society of Safety Engineer is one of the most important safety organizations in the country which is why it comes as no surprise that attending their annual conference is always worthwhile. Hundreds of safety professionals from across Canada, the U.S. and beyond join each fall to learn about the most current safety information, tools and practices available to ensure their workplaces are up to date and compliant. One great thing about the CSSE show is that each year it moves to a new location across the country; a major bonus for individuals who may not have a lot of work flexibility to travel. Last year it was Niagara Falls, this year it will be in Winnipeg and in 2020 it’ll be taking place in St. John’s. For any of you who live in Quebec, here’s a great French Canadian safety show to keep on your radar. This robust safety conference focuses on innovations in the prevention of work accidents and occupational diseases. There is a huge list of safety pros lined up to present (you can read more about them here) at the 20+ sessions which cover the newest in health and safety. Between sessions, be sure to walk the trade show which will include nearly 200 exhibitors! There you have it! From experience, these are the top ten safety trade shows you should check out in 2019. Keep in mind that we’ll be at each one, so be sure to stop by our booth and say hi! Cheers to a new year of opportunities, learning and working towards making a safer tomorrow!